Solar energy has come a long way from being a luxury trend. Today, anyone can jump on the solar express and leave traditional utility thanks to newer, less expensive offers and tax incentives from the government. Still, many homeowners hesitate to make the switch thinking that a solar installation is not as good or as easy as solar sales associates make it out to be. Myth: Solar Power Systems Will Not Work in My Cloudy/Rainy/Snowy Area. Solar panels are extremely popular in sunny states like Arizona, California and Colorado. While it is true that the panels will generate less energy on a cloudy day, indirect sunlight scattered by the clouds can still reach them. Look at Germany, for example. The country experiences cloudy skies half of the year and it is still regarded as the solar energy capital of the world. Myth: Solar Power Systems Are Expensive. The cost of solar panels has gone down tremendously over the years. In many cities in the United States, financing the system can cost much less than purchasing electricity from a local utility company. Families can save money through various financing options. There are also tax breaks and other incentives that cover 30 percent of the initial costs. Myth: The System Is High-Maintenance. In reality, only minimal upkeep is required for a solar panel system since it has no moving parts. You just have to take care of removing dirt and debris a few times a year. You will also have to clean the surface occasionally with a damp cloth or sponge. Do not let these common myths stop you from enjoying greater energy savings with an eco-friendly system. Get in touch with a reputable solar panel company today. 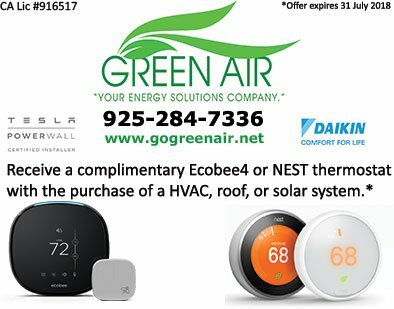 Call Green Air at (925) 284-7336 to get started. You may also fill out our contact form to schedule for a free consultation. We serve clients in Oakland, CA, and surrounding areas in California. Copyright © 2019 Green Air Heating and Air Conditioning, Inc.
Green Air Heating and Air Conditioning, Inc.